Home Page the source for laryngectomee and larynx cancer information. 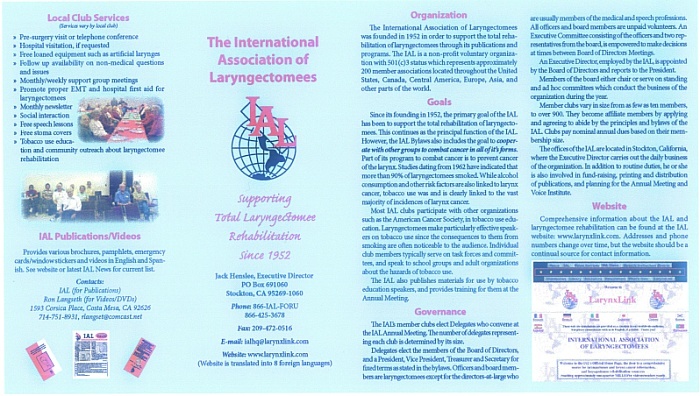 The International Association of Laryngectomees (IAL) is a non-profit voluntary organization composed of approximately 250 member clubs and recognized regional organizations. These clubs are generally known as “Lost Chord” or ” New Voice” clubs. Clubs are composed of from 10 to more than 300 Laryngectomees. The purpose of the IAL is to assist these local clubs in their efforts towards the total rehabilitation of the Laryngectomee. This is an educational and social program for laryngectomees and those who love them. It includes the annual business meeting of the organization. given assistance with developing speaking skills, if needed. This is the unofficial site of The International Association of Laryngectomees (IAL). The information is current, clear and accurate but it should not be construed to be complete or exhaustive.